An independent report by national dam engineering experts says "long-term systemic failures" led to the collapse last year of two spillways at the nation's tallest dam, and subsequent mass evacuations of areas near Oroville in Butte County. The nearly 600-page report prepared jointly by the Association of State Dam Safety Officials and United States Society on Dams cites a string of failures from flaws in the dam's original design and construction in the 1960s, to the bedrock upon which it was built, to lapses in ongoing inspections over the decades since. "The seriousness of the weak as-constructed conditions and lack of repair durability was not recognized during numerous inspections and review processes over the almost 50-year history of the project." In the wake of the crisis, the questionable rigor of routine dam inspections and lack of response to inspectors' recommendations became a focus of state legislators, who went as far as suggesting that the dam's management be wrested away from the California Dept. of Water Resources. "DWR has been somewhat overconfident and complacent regarding the integrity of its civil infrastructure and has tended to emphasize shorter-term operational considerations. Combined with cost pressures, this resulted in strained internal relationships and inadequate priority for dam safety." In a statement, DWR Director Grant Davis (who joined the agency since last year's crisis), said the report is "consistent" with the findings of the agency's own independent review, and that lessons from that were "fully incorporated in the design of the reconstructed spillways." DWR rushed to complete a partial rebuild of the dam's spillways before the start of the current wet season, last November. But almost as soon as work on the replacement spillways wound up, concerns arose about cracks appearing in newly-poured concrete on the main spillway. During intense winter storms last February, water levels behind the 770-foot-high dam rose to the point where the dam's principal spillway broke down under pressure from necessary releases into the river. 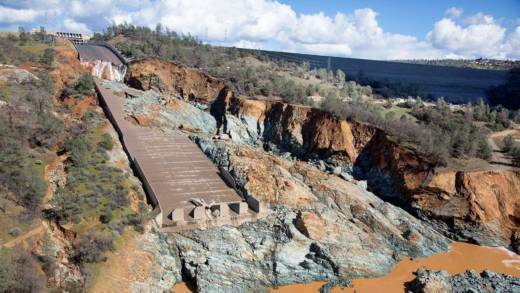 When the dam's earthen "auxiliary" or emergency spillway began to disintegrate as well, evacuation orders went out to about 800,000 people in Oroville and other communities downstream of the dam. The IFT report issued today called the near-disaster at Oroville "a wake-up call for everyone involved in dam safety."